A couple of days ago I decided rather spontaneusly to take my photographer friend, Niels, along for a small impromptu factory visit. I've been meaning to do some new factory visits, but I haven't really had the time, nor has it really been possible, as the few factories or craftsmen left in Denmark are scattered all over the country, which makes having a car or some other mean of transportation a neccessity. 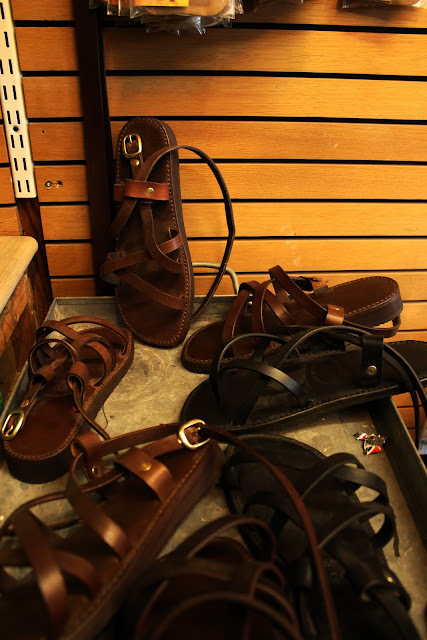 However I knew, that there was a cobbler close to my place, that makes sandals, when he isn't repairing shoes, bags and other leather accessories for his customers. Furthermore I knew, that he has some very nice machinery stashed away. We did get to see some, but not all unfortunately, as most of it is located in his other workshop. With that in mind we decided to go for a walk and meet up with shoemaker, Helge Larsen. Helge Larsen sailed the seas, when he was young, but after some years at sea he met a beautiful girl in Aarhus, which made him decide to end his seafaring days. A rather classic sailor story. 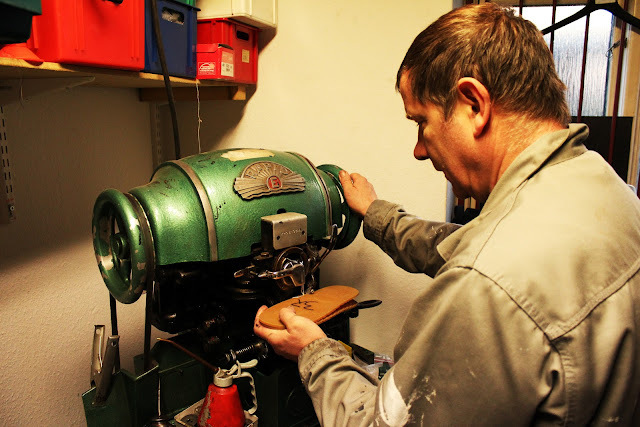 But that didn't make him take up shoe making, instead he worked odd jobs, until he decided to become an apprenticed shoe maker almost 5 years ago. Working with leather wasn't some kind of new found hobby for him. He has been doing it for many years. It first became a time consuming hobby, when he started making bags for motorcycles for himself and friends. 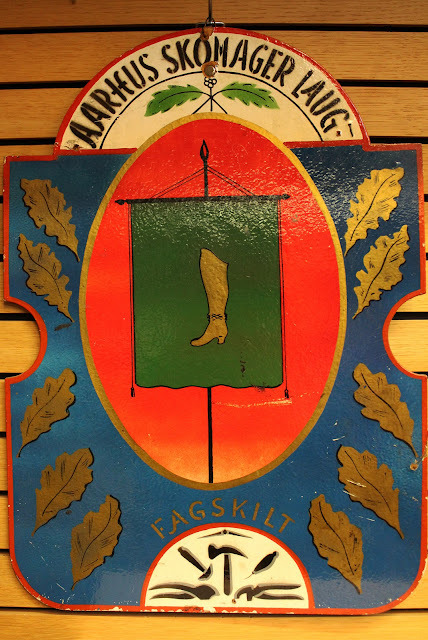 Years later he decided to get his apprenticeship as a shoemaker, which he did in Aalborg and he even got a scholarship for being particularly skillful. It was also as an apprentice, that Helge acquired valuable skills, contacts and machines, that now ensures his daily bread. He told, that while his fellow students enjoyed their free time after school, he would pick up his bike and drive around to fellow shoemakers and thereby he learned the tricks of his trade. 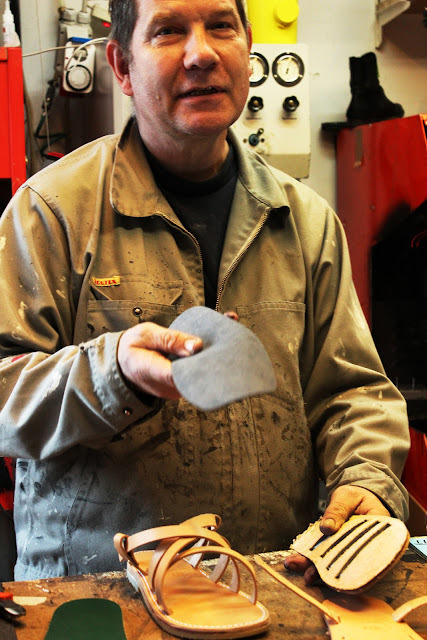 Or as he stated in Marxian terms "Knowledge is power"
Helge walks us through the process of making a pair of sandals. The parts are all cut using a clicker press, then the parts are either stitched together on one of his amazing sole stitchers or riveted on his rivet machine, which we unfortunately didn't get to see, but I'm sure, that it's as nice as his other machines. Finally straps are added and a lot of other different processes like attaching the buckle, rounding the edges on the straps and cutting holes on the straps. One thing is sure, Helge has his equipment covered. 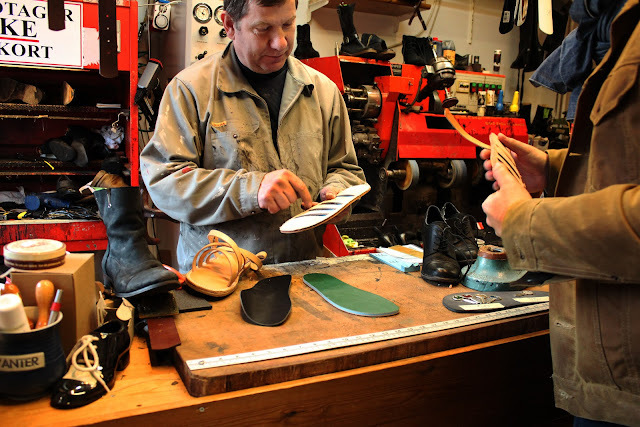 He has been buying equipment from other shoemakers, that closed its doors, old factories and from retired leather craftsmen. Therefore he has quite a lot of equipment, that was produced on the Vilhelm Pedersen factory in Høng. 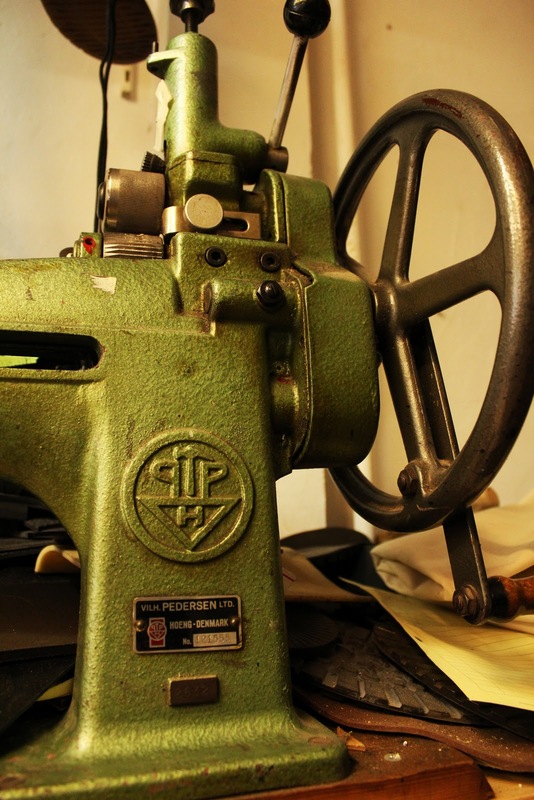 The Vilhelm Pedersen produced machines for a lot of different industries in Denmark. Among others the shoemaking industry, which basically was totally shut down by the 70's, but up until then it was quite a thriving industry. 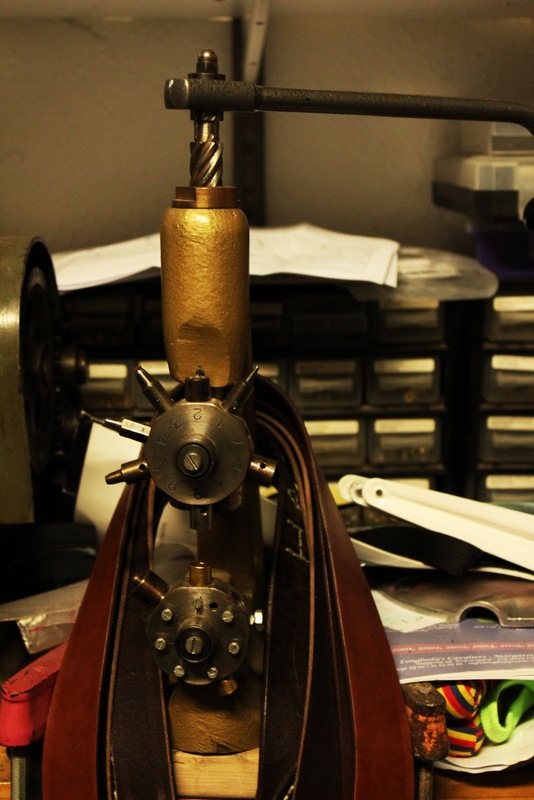 Among leather geeks Vilhelm Pedersen is known for making its own edition of the iconic Junker&Ruh SD28 (please follow this link) hand-driven sole stitcher. 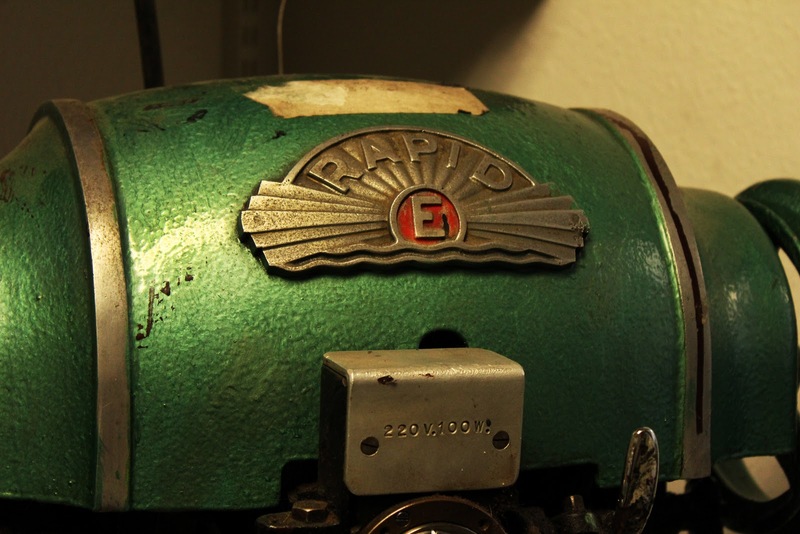 And Helge has one of these machines, but we didn't get to see it, but we did get to see the pride of his machine collection - his Rapid E. The Rolls Royce of sole stichers. When you see this machine, you'll probably be quite awestruck. It's a monster. The thread, that it uses is thick as a rope and the needle looks like a knife. You could potentially sew through a brick with it. He told us, how he got his first Rapid E stitcher for free basically (he now owns three of them in more or less working condition). It didn't work, but he still bought it for a friend. 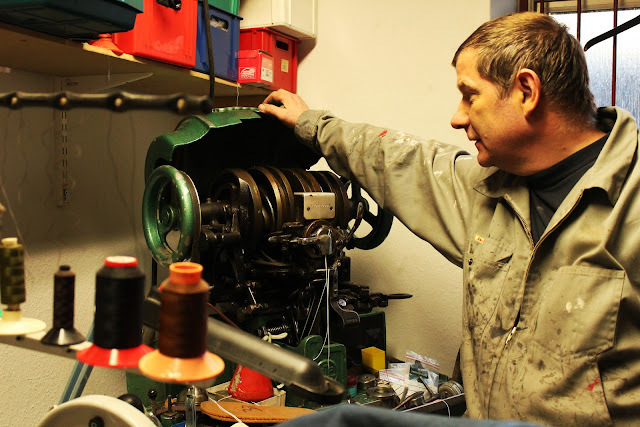 He fixed the machine himself and made it sew again. Helge has no education, when it comes to fixing machines or refurbishing machines, but he is still almost always able to do so himself. 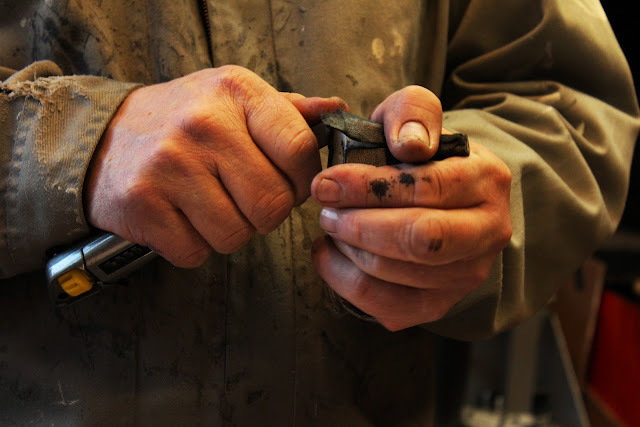 He told us stories of how he would take things apart, when he was a kid. As he got older, he would also start putting things together again. He needed to know, how things work. 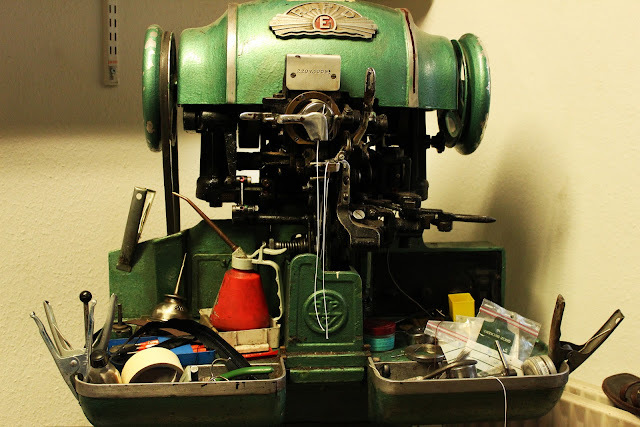 Apparently he also learned, how the Rapid E works, as he has managed to increase the stitch speed from 300 stiches per minut to almost double speed at 500 stitches per minut. Time is money, as he puts it. Now for some images of the sandals, that we came for. There aren't many makers of sandals left in Denmark, however I know of two other producers, which will of course eventually be featured here. The sandals are made of a 3mm thick vegetable tanned leather and they are equipped with a rubber sole. 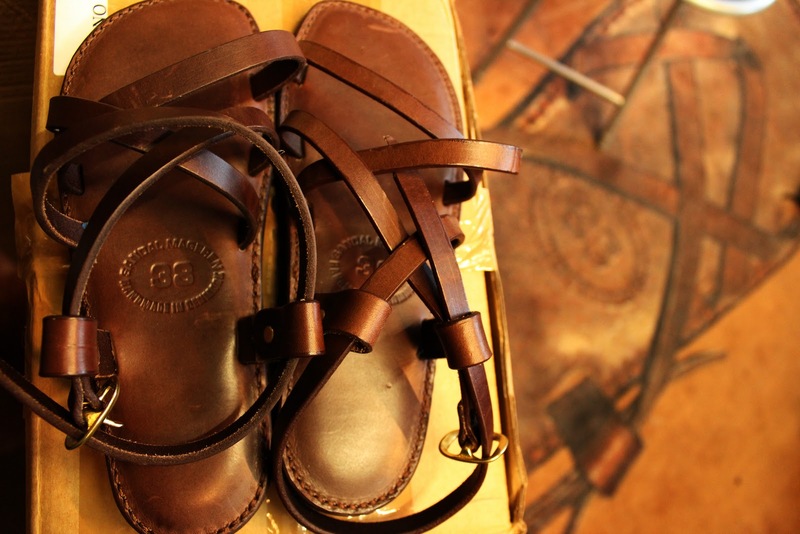 They carry the name Sandalmageren, which basically translates to "The sandal maker" In case you are wondering the buckle is a pretty standard solid brass buckle. They are made in both sizes for men and women. Although I think a lot of men are put off by the thought of wearing sandals either by hippie-connotations or images of old men wearing them with socks. Many of these Danish made sandals are quite masculine and very solidly built - or as Helge says "The only problem is, that they last a good 10 years, so it takes a while before I see the customer again"
The sandals are available through Helge's own website. Or I'll gladly swing by and help you find a pair. 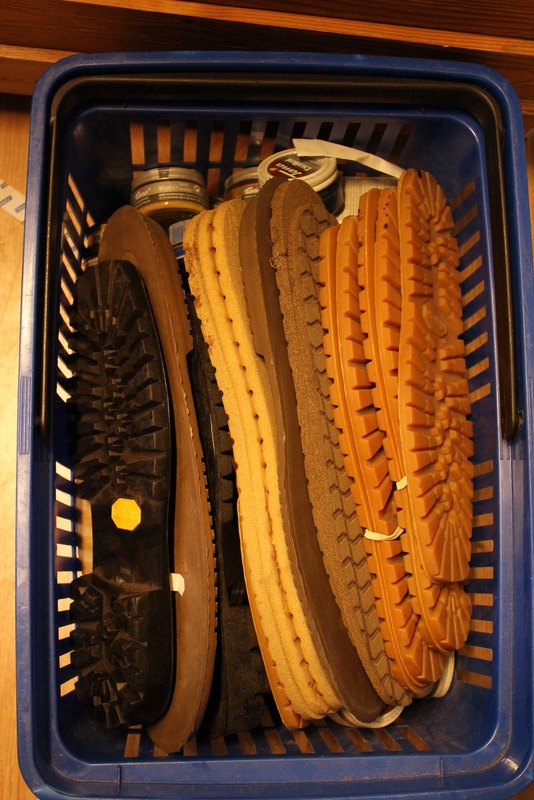 In the back of Helge's workshop I found this box of Vibram soles. 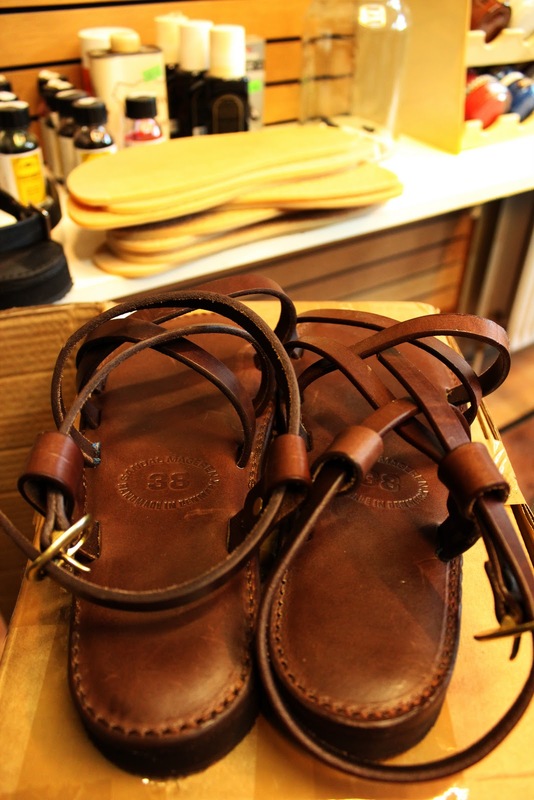 I don't think I'm much of a sandal man myself, but if I could have them equipped with a mini-lug sole from Vibram, I would definitely think about it twice. Maybe I'll take this idea to Helge to see if it could be made. Or at least I know, where I can have my boots and shoes equipped with a new Vibram sole and I know, that his Rapid E will stitch through anything. 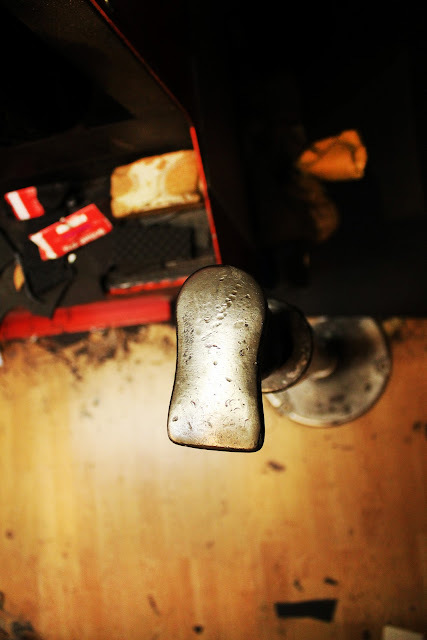 Now if you are in Aarhus, Denmark, and in need of shoe repairs, I'm sure, you won't find anyone as capable as Helge. I'm also sure, that he'll throw in some free advice on how to maintain your shoes. He is a very straight forward man, that will give his honest opinion on just about everything. 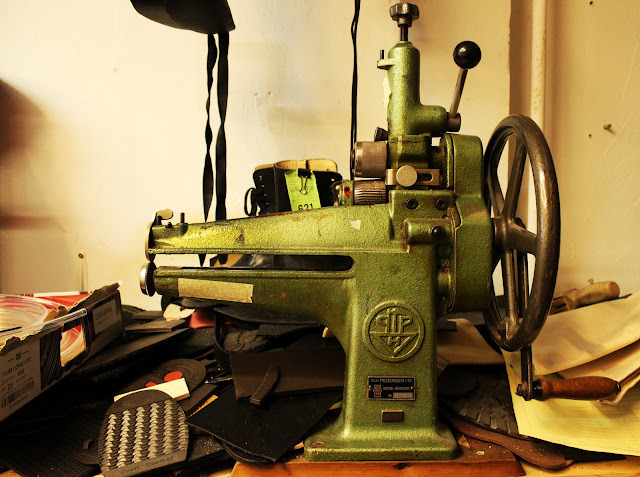 Lastly if you work with leather and in need of something special, I'm sure, that Helge is the right man to find it. His network is big and he has a nose for finding things. Again, "knowledge is power"
Thank you very much, I think Niels will be very pleased to hear so. It means a lot to me as well. 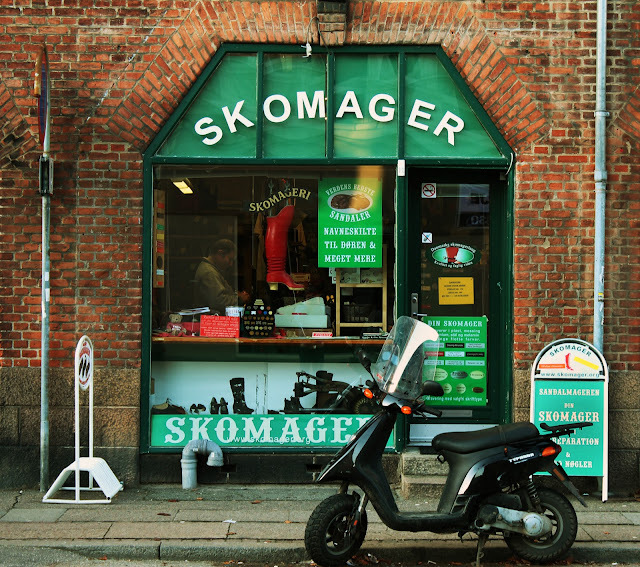 My friend, Alan Addicott, had a shop called Sandalmageren in Aarhus in the 70s. It was located at Graven 23. Hi D Rat, thank you so much for sharing the information. If you still have contact with Alan, I would really like to hear about the leather trade in the 70's. 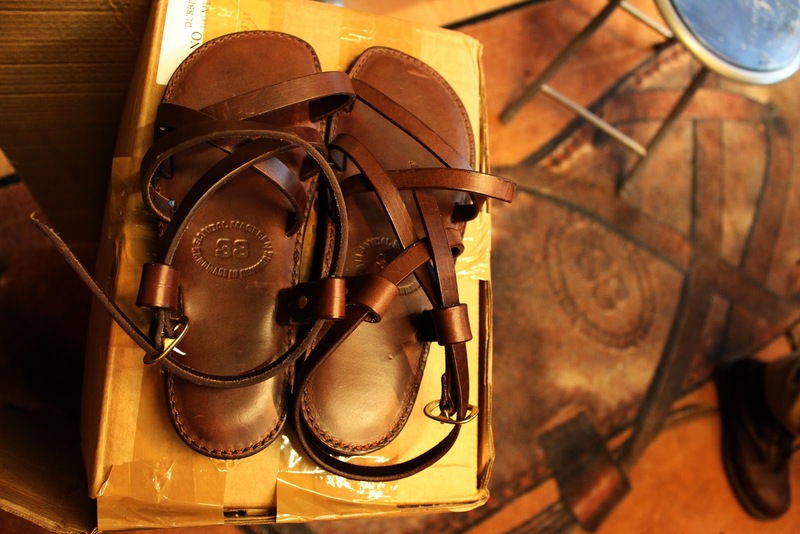 It could very well be his dies that these sandals are cut from. I think, Helge bought the name "Sandalmageren" along with the models and dies some time ago. Sadly Alan passed away in California many years ago. Hi D Rat, thanks for getting back to me, albeit with some sad news. I hope he lived a long and good life.